My Rotten Dogs: Raw-Fed Dog Poop. What's "Normal?" Raw-Fed Dog Poop. What's "Normal?" I am a reformed member of the "Poop Police." 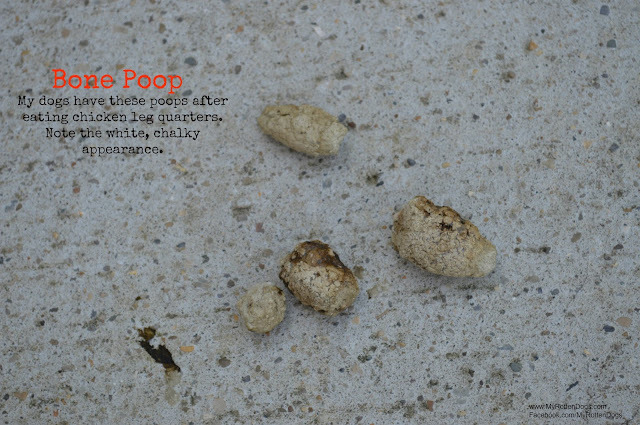 I used to obsess over the quality and quantity of my dogs' poops. Part of it stemmed from the multitude of GI issues that Neeko had as a puppy, and some of it was because I was not a confident raw feeder, and was worried that I was constantly doing something wrong with my dogs' diet. Kibble-fed dogs typically have poops that are the same size and consistency, because they eat the exact same thing, day in and day out. 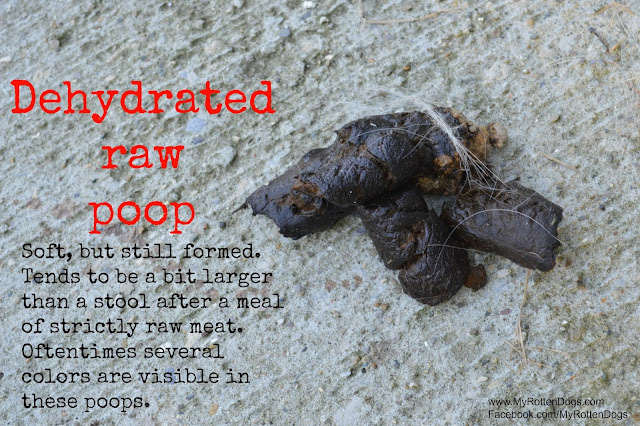 Most raw fed dogs are offered a variety of foods, and their poops will reflect this. I no longer obsess over dog poop. In fact, I don't even regularly check it. I notice it when scooping, and can usually tell which meal caused that poop. ONE liquid poop is NOT diarrhea. A mushy poop is not a problem. (unless it's in the house...) A one time gelatinous poop is not cause for concern. The GI tract produces mucus if something irritates it, like a twig. I'm looking at you, Bruce. 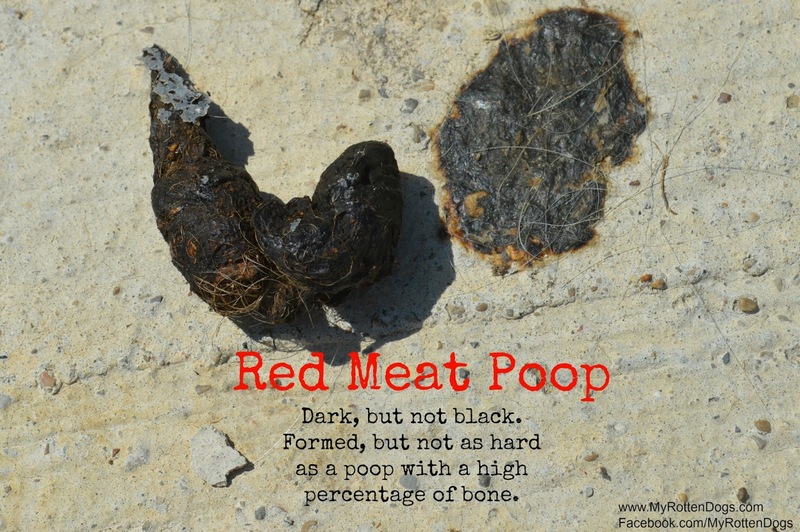 Raw-fed dogs can have black, brown, tan, grey, and white poops, along with every color in between. They are all "normal" except bright red blood red poop. They can be hard, firm, soft, mushy or liquid. Just like humans. Raw feeding is kind of scary. Most groups "teach" people to be weary of digestive upset and explosive poops when transitioning a dog to a raw diet from a kibble-based diet. This creates diligent members of the "Poop Police." This is not necessarily a bad thing, as some dogs do have some GI issues during the initial transition phase. All dogs are different. I have read of raw fed dogs who have explosive diarrhea if they eat a single bite of kibble. 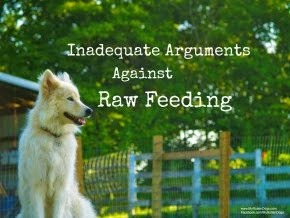 Raw feeding has made my dogs have incredibly healthy guts that can tolerate anything. Faolan ate over a pound of grain-free cat kibble last week, without a single ill effect. 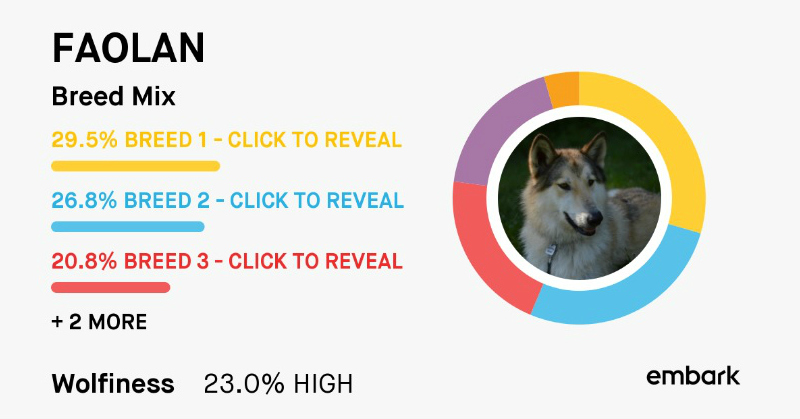 Variation in poop color and consistency is perfectly normal and to be expected, unless the dog is eating the exact same thing, day in and day out. Unless a dog cannot control their bowel movements, has several liquid stools, or is passing bright red blood, try not to over think or over-complicate things. WARNING-poop pictures after the break! Bone poop. I am starting with this because it seems to be the type of poop that many raw-feeders strive to attain. This is a bowel movement from a 90 pound dog after a meal of a large (20 ounces) chicken leg quarter. Small, hard, and white due to the bone/calcium content. This is normal after that meal. I do not feed chicken leg quarters exclusively, as that would be too much total bone, and not enough variety or overall nutrition. 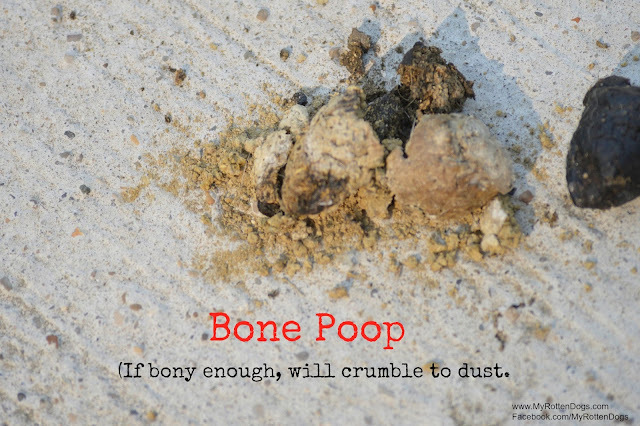 Many raw feeders "brag" that their dogs poop does not need picked up, as it crumbles to dust. (All dog poop should be picked up, but I digress.) In my opinion, it is nothing to brag about, as it means the dog is eating too much bone, and not enough organ and boneless meat. Red meat poop. The above occurred after a meal of pork heart and beef kidney. It is dark, but formed. I moved the poop over so that the small amount of liquid that initially came out is visible. Still normal. I occasionally feed my dogs an entire meal (one pound or more) of liver or kidney. Large amounts of liver tend to produce black poops that are very soft or semi liquid. I expect it afterwards, and it is normal. Again, one episode of controlled liquid stool is NOT diarrhea. Boneless white meat poop. White meat (chicken, turkey, rabbit, etc.) 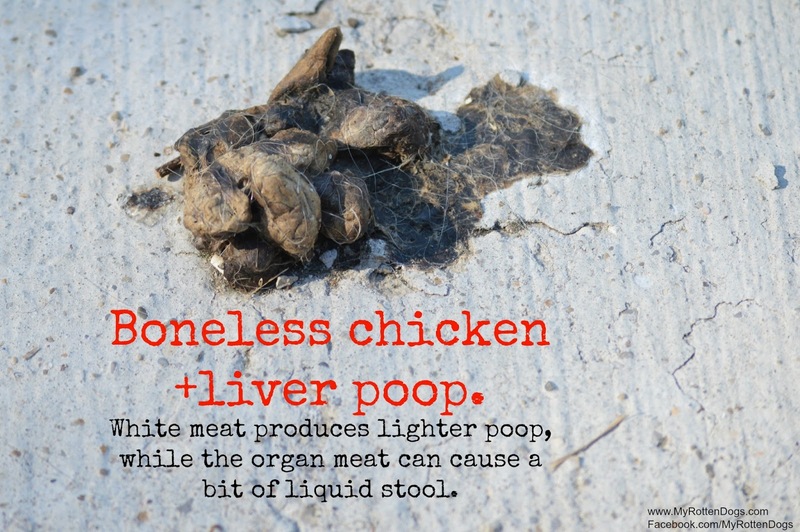 produces lighter colored stool than red meat, typically tan to light brown. The above was following a meal of chicken thighs and beef liver. The liver caused a bit of liquid initially, followed by formed, light-colored poop. Dehydrated raw poop. These are by far the most colorful poops, due to the fruits and vegetables contained within some of them. They range in color from brown to orange, with bits of vegetables visible at times. Typically well formed, and somewhere between semi-soft and firm. There are a wide variety of colors and consistencies presented in the photos. All are normal, considering what the dog was fed prior to the bowel movement occurring. I've already stated it once, but I'll repeat it-Variation in poop color and consistency is perfectly normal and to be expected, unless the dog is eating the exact same thing, day in and day out. Unless a dog cannot control their bowel movements, has several liquid stools, or is passing bright red blood, try not to over think or over-complicate things. I am not veterinarian. Please seek medical attention if your dog has bowel movements that are concerning to you. That is so fascinating! Thanks for sharing! I can't help but chuckle a bit, but this is really a great post. I had to read because I was interested in knowing myself. Much of today's dog food has been designed to make "dog waste" easier to scoop. It's low in moisture. Back in the old days, even when I was growing up, dog poos were softer. 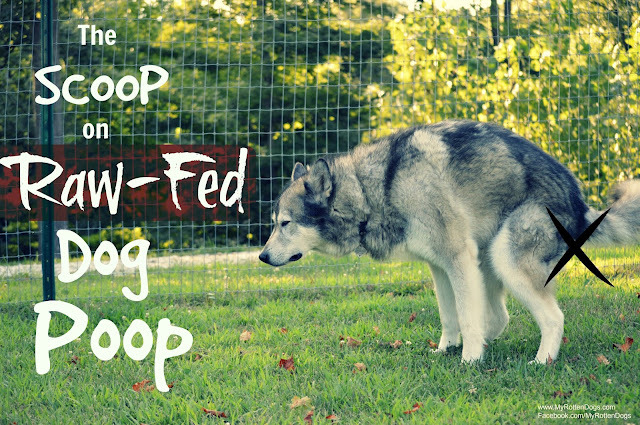 It's no surprise that a raw-fed dog would poo differently. Great subject. Ok this was a well needed post!!! 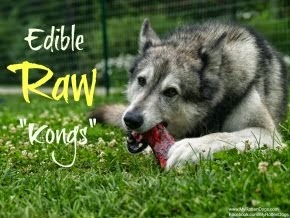 Because lately I have been giving my dogs raw bones, and raw chicken hearts as a treat. Their poop was all weird and white like that, and I had wondered if it was normal!!! And that's when you know we're all dog people, haha! I feed a rotation diet of kibble, canned, dehydrated (raw and cooked), and a bit of PMR. It's kinda cool to see what makes what, LOL! I'm an expert at our dogs poop too. I've been tempted to take pictures, but haven't done this yet. Our girls sometimes have super dry poop and that's usually when they have a diet with too much bone so I've cut back on the bone when I make duck meals and add a little more fish oil to their diet. I've decided to start making a calcium supplement from egg shells. And I agree; dog poop should always be picked up. We live on a big property with shovels in key places so that we can keep our yard clean. No one likes to step in dog poop. What a great post! And so funny, but so true! You're so right, a dog's poop is not going to be the same every day on a raw diet, especially if they're eating a variety of foods - which they should be! I love the pictures! Haha! I'm glad you posted photos of what each raw poop looks like. Were there any accidents in the house when switching to raw? I'd worry about explosive diahrea when I'm at work. s. Numerous thoroughbred dogs are especially powerless, however it's feasible for any dog to create joint inflammation or a joint dysplasia. Have you given self serve dog wash a try? Thanks for sharing this information. I really like your blog post very much. You have really shared a informative and interesting blog post with people.. Can Dogs Eat Rice ?